The course site has wonderful vegetation, undulating terrain, and a superb river meandering through the course. This is a course where you feel like playing in a jungle crossed with a golf links course. Weaving through rubber plantations, cocoa farms and coconut palm trees, it also serves as a natural habitat for wildlife like eagles, monkeys, hornbills, woodpeckers and crocodiles. The water of the creeks, the ponds and the lakes come into play for 10 holes and there are many natural hazards around the greens, which makes every shot very demanding. It also features fairways with natural undulations that look charming. It is designed to be the ultimate challenge for the serious golfer with a high level of risk-reward layouts. To have a good score, you need long and precise tee shots as well as pinpoint accurate approach shots to hit the gently undulating small greens. Some of the fairways are generously wide and the narrower ones tend to offer bailout areas for those who cannot make high-risk shots. This is definitely a course you would really like to play more than once. A beautiful but demanding par 3 over a pond. It is all carry over the pond from the tee to the small green and anything short, right or over, will result in a double bogey or worse. When the wind is strong, you had better not aim at the green but to the left of the green that is the only area with no water coming into play. There was a sign “Watch out the crocodiles!” near the pond. Actually I ran across a baby crocodile and appreciated that I was playing golf in such great natural surroundings. A gentle uphill par 4 with a series of deep bunkers guarding the left side of the fairway. The green is elevated and one extra club is required to reach the green. A slight dogleg to the right, a signature hole that has been selected as one of the best 500 holes in the world in 2000 by US Golf Magazine. The entire hole is visible from the elevated tee, so you can see the double fairways. Playing safe is to aim to the left side. The bigger challenge is to aim for the smaller lower right side fairway bordering hazards, and you could go for the green in 2. A medium length downhill par 4with the tight fairway. The tiny green, nestled at a bend of the river, is surrounded by the hazards, so the second shot becomes extremely difficult, but the green and around the green look very charming. Crocodiles are found to be living at the bend behind the green. A long and difficult par 4. The tee shot is a little downhill and the second shot is over a pond. The elevated green is guarded in front by water and bunkers. A slight dogleg to the left par 5 with a great design. Long hitters may be able to reach the green in 2 as long as they can hit 240 yards over the valley. The second shot is steeply strong downhill and the green is guarded by several huge trees and a river. A challenging, pretty hole with a relatively tight fairway. Accuracy off the tee is required on this hole, with a well-aimed shot finding a plateau set in a cocoa plantation. From there, you must find the green nestled below among coconut palms and guarded on the right side by a beautifully landscaped stream. A sharp dogleg to the right, a dramatic par 4. It requires a left to right drive, When you play next to the ravine on the right, you will be rewarded with an open approach to the large green which is tightly guarded by the river, two large trees and a bunker from on the left. A great finishing hole, an almost straight par 4. Even after a good drive, you must clear a lake which extends 150 yards in front of the elevated green. The lake, the green and the club house behind them look very nice. 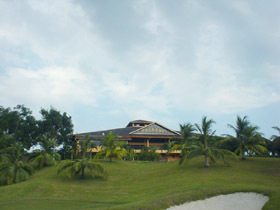 It is a 45-minute flight from Kota Kinabalu to Tawau Airport and 15 minutes to get to the course from the airport by car. The yardage sticks are measured from the front edges of the greens, not the center of the greens, so you need to be careful. The other Robin Nelson & Neil Haworth designed courses in Asia are Sun Island International (上海太陽島國際) GC, Kunshan Sunisland (昆山太陽島國際) GC, Qingdao Huashan International (青島華山國際) CC, Sheshan International (佘山國際) GC, Guangzhou International (広州仙村國際) GC, Jade Dragon Snow Mountain (玉龍雪山) GC, the highest altitude of golf course in Asia, Century Seaview (世紀海景) CC, Xili (西麗) G&CC, Shenzhen (深圳) GC and Huizhou Tangquan (恵州溫泉) GC in China, Warren G&CC in Singapore, Kuala Lumpur G&CC in Malaysia and Bali G&CC in Indoneshia. The owner is a Malaysian Chinese. In Chinese, Shan stands for mountain and Shui for water, hence the name Shan Shui G&CC.